An IT solutions provider shares his tips for selecting a remote monitoring and management tool for your channel services business, as well as some of his favorite features in Managed Workplace 2011. As a managed services provider, I know first-hand the importance of choosing a good remote monitoring and management (RMM) solution. In this tip I will share the process you should go through when selecting an RMM solution and tell you how I came to choose Managed Workplace 2011, as well as provide some details on the features I like in this release. This year, other RMM solutions have released new versions as well including Kaseya, Labtech, N-Able and Zenith. Channel resellers selecting an RMM solution should conduct a good amount of due diligence. First, you want to identify the business and technical needs of your practice prior to starting your search. Each RMM solution has different pricing models and methods of how you purchase the software. For some providers a subscription based model may work out better in the long term and offer a lower cost of entry. Per site based pricing vs. per device based pricing is something that you will also vary between the various RMM solutions. Either way you are going to want to make sure that you do not get priced out of the tool once you start to grow. 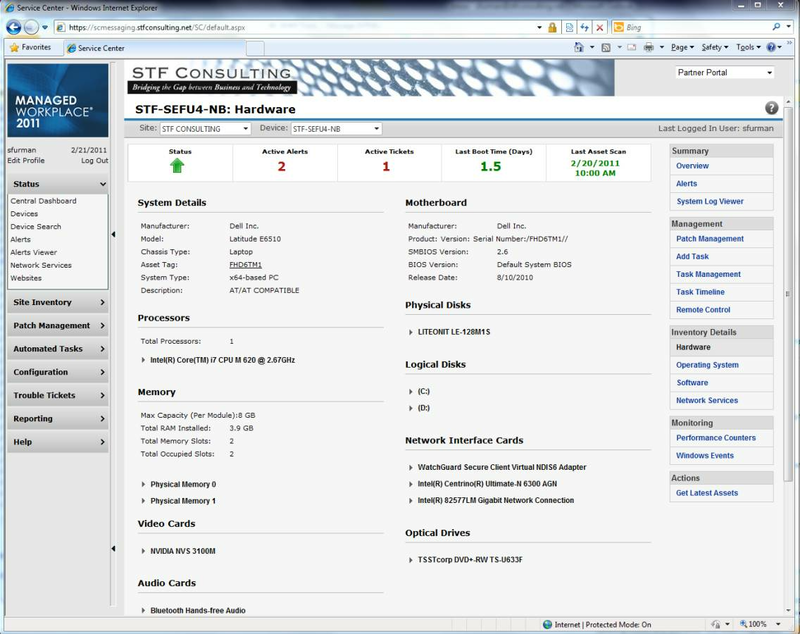 RMM providers that have Web-based user interfaces are way ahead of the curve. Every line of business application moving forward will be focused on being Web-based and cross platform compatible. RMM providers that have their eye on the future will also be orientated on how the cloud will play a role in our offerings. 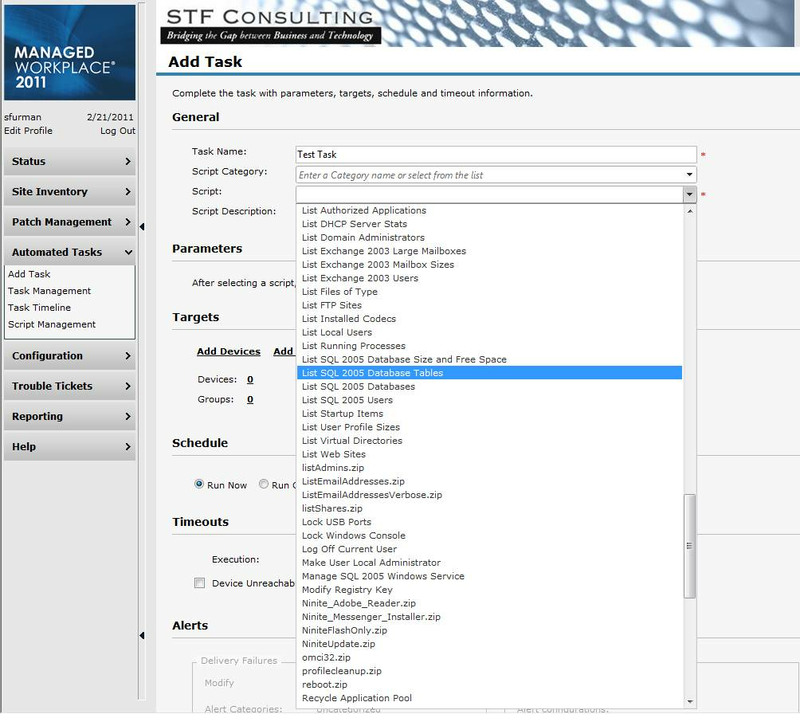 Integration into the major PSA Tools (Connectwise, Autotask and Tigerpaw) is also an extremely important aspect during the selection process. Having the full integration between both tools will definitely help to streamline your processes. Five years ago I went through this process. One of my key considerations was to have a very close relationship with an RMM provider that would allow us to have influence on where the product was headed. The use of Level Platforms in our business has been instrumental in building our Managed Services offering. In 2008 we were asked to sit on the LPI Partner Council to help guide the direction of the product. This position offers us the opportunity to interact with the product development team frequently to ensure that our investment is on track. Most recently I was invited to Ottawa to talk with the development team regarding some of the functionality that we would like to see in future releases. These capabilities included interactive remote control and maintenance schedules. Now, this new functionality is slated for a summer release schedule. I look forward to working with LPI in the preliminary design phases of these new features to make sure it delivers on target. 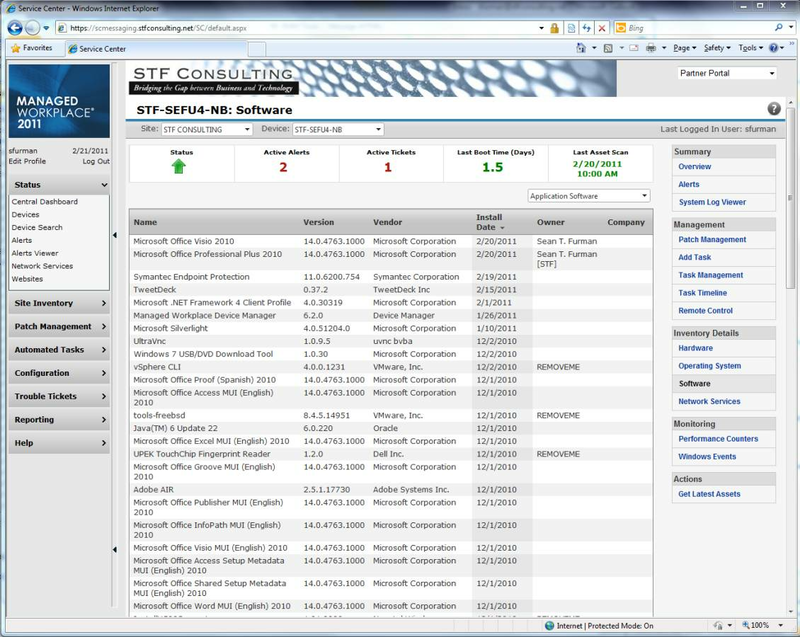 Managed Workplace 2011’s new features greatly improve my ability to provide excellent automatic and hands-on service to my customers. The new automation framework and large script library make it possible to design an effective maintenance service. 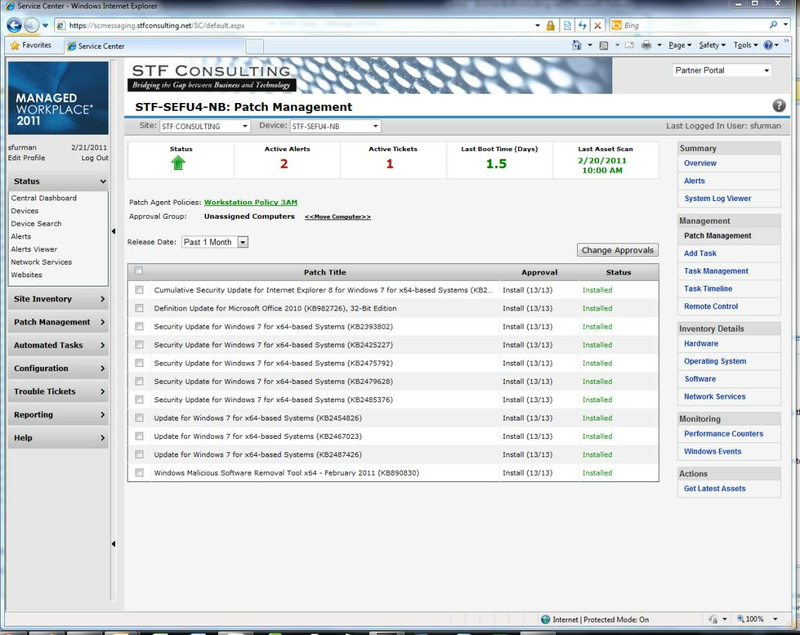 The ability to trigger scripts based on alerts that are occurring on our customers’ networks has us very excited. It is so powerful that we’ve only begun to scratch the surface of what can be done. It’s a snowball effect. As the existing scripted solutions get rolled out into production, they free up our time to develop more automation and win new business. If you would rather outsource your script development Level Platforms now offers automation on demand service. We have taken advantage of it a couple of times now and it has worked out very well. We rely on Managed Workplace 2011 to provide deep and thorough information about my customers’ IT assets. 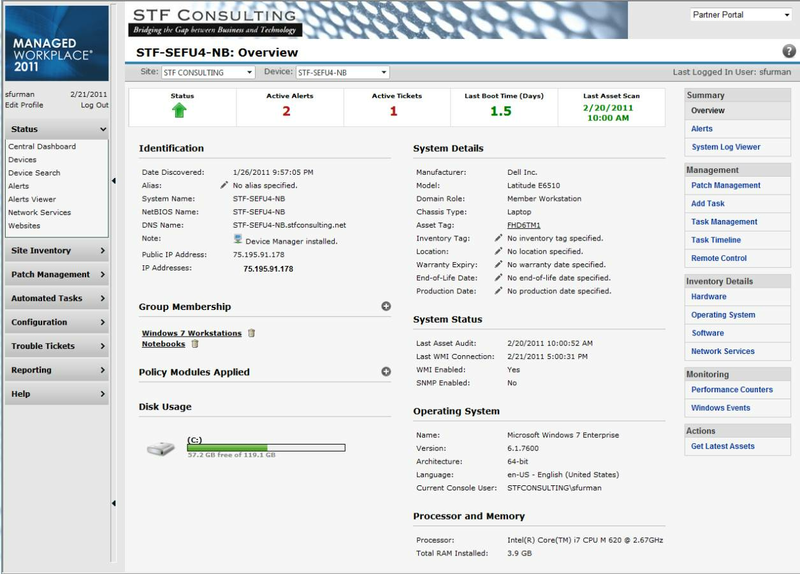 The device management pages provide at-a-glance summaries of the most important assets (CPU, disk space, NIC), but I can drill into anything for more information. Prior to these improvements, I had to remote into a Windows Server to figure out what kind of memory to order for it. Now I have the part number listed in my Service Center. By far the biggest improvement in Managed Workplace 2011 is the new hybrid architecture. I’ve always liked the fact that I could drop in an Onsite Manager and be monitoring hundreds of machines in the time it would take to install three agents. Agentless is fast way to get up and running on a healthy network. But there are times when you just can’t go with an Onsite Manager server; maybe the client has too few server resources and can’t afford a dedicated server, so having an agent solution for these situations is ideal. This type of functionality provides us strong ROI time and time again. Sean T. Furman is president and founder of S. T. F. Consulting, a Microsoft Gold Certified Partner in New Jersey. Sean has Microsoft MCSE 2000/2003+S, MCSA 2003, MCTS 2008 certifications.